First Aid is a vital element of Air Cadet training. The number and range of environments in which we train can result in Cadets and Staff encountering many and varied incidents. It is of great community value to us to be able to respond proficiently and professional on these occasions. The confidence that it instils with the Cadets though comprehensive first aid training, allows them to assist in the most appropriate manner. This can be from, as simple as calling for help and applying a plaster to more in-depth first aid skills. 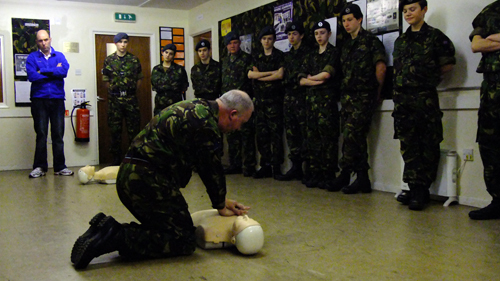 First Aid is also a training requirement of other Air Cadet activities, for example The Duke of Edinburgh’s Award. Part of which requires the participants to be fully proficient for an expedition or exploration lasting from between two to five days (depending on level). This includes being able to deal with a potential incident and promote well-being at both individual and team level. In order to meet this requirement the Air Cadet Organisation in partnership with the British Heart Foundation and St John Ambulance has designed the following courses and qualifications. Firstly Heart Start which is a 3 hour basic Life support lesson with no assessment at the end. Then Youth First Aid which is a assess course with an exam at the end. Both can be taught and awarded at squadron level.